Since ancient times, garlic has been used as a home-remedy for a wide range of ailments. It is especially valued for its antibacterial properties and has been proven to prevent and fight infections. Garlic is a potent immune booster. When the immune system is strong, it has the ability to stave off pinworms, colds, viruses, and the flu, including the Swine Flu and other seasonal illnesses. The core of the garlic – the thin, central bulb known as Allicin – has more healing power than all surrounding bulbs put together. 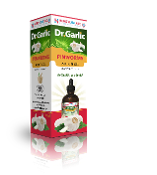 Allicin Oil is extracted from the central garlic bulb. Each precious drop of oil is a power-house of antibacterial, antiviral, antifungal and anti-yeast properties.